Happy Saturday! Another beautiful day in London town. Today's sweet and healthy recipe is a raw mango cheesecake. I love raw cakes! I was first drawn to them because they are so clever. People are so creative and can make all sorts of cakes using only raw ingredients. They are so yum and don't leave you feeling heavy and sick. All you need is a food processor and fridge and you are good to go! I used my Love Bites recipe as a crust. The quantity I have posted there works well for this cheesecake. Follow the same directions as when making Love Bites. Press the crust into an oiled tin and place in the fridge to set. Blend together the mango, cashews, lemon juice, vanilla and stevia until thoroughly combined. Add in coconut oil and blend together. Pour filling into tin on top of the crust and place back into the fridge to set. It's best to let it set in the fridge overnight, but if you can't wait that long pop it in the freezer for a couple of hours! 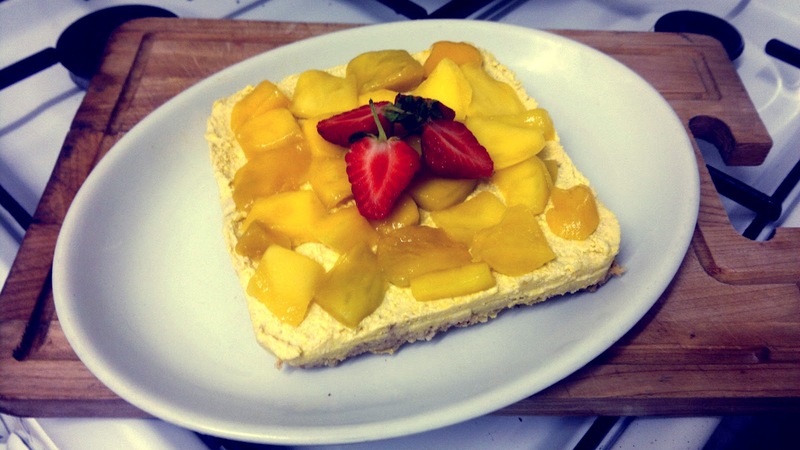 Top with sliced mango and strawberries and enjoy! 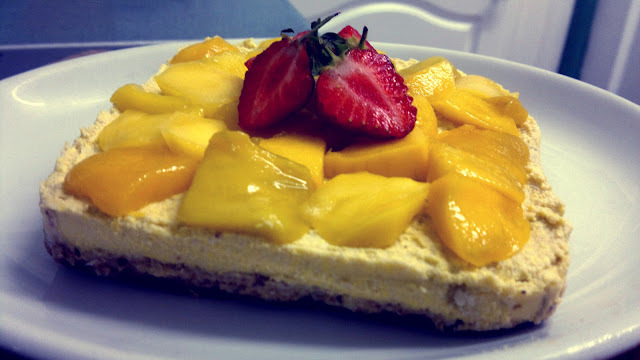 So much creamy mango-y goodness! Absolutely amazing - thank you!! !